There are ways we can enable our children that are positive. I had a conversation this week with an employee of a doctor’s office. She said that there are times when adult children will come in after their parents have made the appointment for them and with a check signed by their parents. These are not 14-year-old children, but adults in their late 20s, early 30s. We should be enabling our children to be able to make their own appointments, pay for their own co-pays, if appropriate, and check in when they arrive at the doctor’s office. Teaching our youth to talk on the phone, speak to an adult and show initiative is a great skill that will serve them well in life. There is no reason I can think of why a grown adult should be relying on his or her parents to make appointments, unless they are overseas fighting for our country or on a mission trip. Teaching our children may seem like we are trying to get them to grow up too soon, but if you don’t do it now, they will be the 30-year-old that doesn’t know how to ask for what they need. Sometimes all it takes is giving them a script to follow in certain circumstances. I am not an expert and knowing that my daughter will be flying alone for the first time makes me anxious, but I hope that she has learned from traveling with the family all she will need to know to make her trip a success. Is it time to let your child grow up? Fellow Americans, correct me if I’m wrong. With all the name calling and degradation in the political parties in the race for the white house, it seems that our legislative bodies need a great deal of house cleaning! It seems in the last few years the governing bodies seem to resemble those debating teams we had in high school. The subject: “We the People”! But we the people have little influence on the outcome of the debate. Our state representatives that are the stakes supporting us are often asked to play the game in the needs of the states. Party lines I believe are a detriment to a smooth running machine. The three words that should be posted in the house should read, “We the People”. As true Americans we should strive to do our part to make America great. America needs to be strong, “Physically as well as mentally” to be able to lend support in a struggling world! Tonight I was driving toward the rotary on Route 302 in Windham when a speeding motorcycle made a tight pass around me and in front of a car going in the opposite direction. Stunned and thinking how that could have been much worse, I saw a police car with lights on in my rear view mirror. I pulled over as it sped by. My car rocked with the speed. I wanted to make a point to thank the police officer for pursuing that motorcyclist to get him off the road. It made me think again how I appreciate that the police are out there putting our safety above their own. The craziness in our nation has brought to my attention that our American flags are spending more time at half-staff then all the way at the top where they should be. 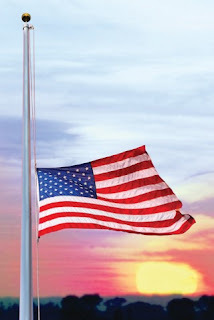 Not too long ago it was a rare occasion when flags were lowered to half-staff, when President Regan died and again when Nancy Regan died or on Pearl Harbor Day. Now we have lowered the flag and no one can keep track of why it’s lowered each day. There is actually an app to remind people where the flag should be flown on that day. The flag has been lowered nine times since January and often it was kept at half-staff for more than one day. In 2015, we lowered it nine times the whole year. We lowered the flags in 2016 for Antonin Scalia, Nancy Regan, attacks in Brussels, Peace Officers Memorial Day, Memorial Day, attack in Orlando, attack in Dallas, attack in Nice and the attack in Baton Rouge. 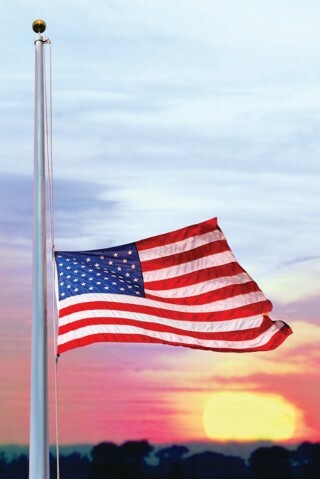 When a flag is raised it should be raised all the way to the top and then lowered to half-staff. The reverse is true when it is retired at the end of the day. It gets raised to the top and then brought back down to retire it. The other way might be quicker, but this is the proper way. Lowering our flag is a sign of solidarity with the communities these tragedies took place in. However, does it come to a point where we desensitize the world to our gesture or to where it doesn’t have the same weight when a president passes away? Are there other ways we can honor victims? This past week I had the opportunity to attend the retirement ceremony for one of my high school classmates and friend. 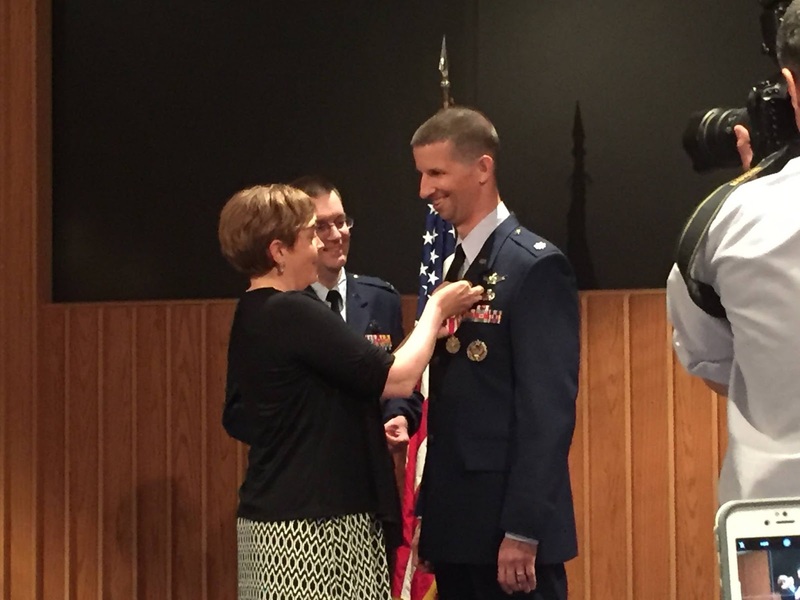 He was retiring from the Air Force as a Lt. Colonel after 21 years of service. 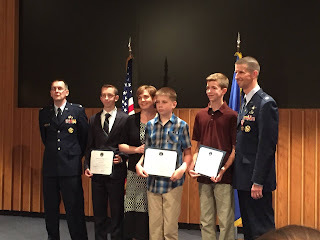 When we received the invitation, I was excited to see a military retirement ceremony. I didn’t think about the fact I would be seeing my friend for the first time in 19 years or that I don’t look quite like I did when I was in high school. He, of course, hadn’t changed a bit. When you don’t see someone for that long, they remain the same age in your mind’s eye. To me he was still 18-years-old despite now being married to his sweet wife and having three children. 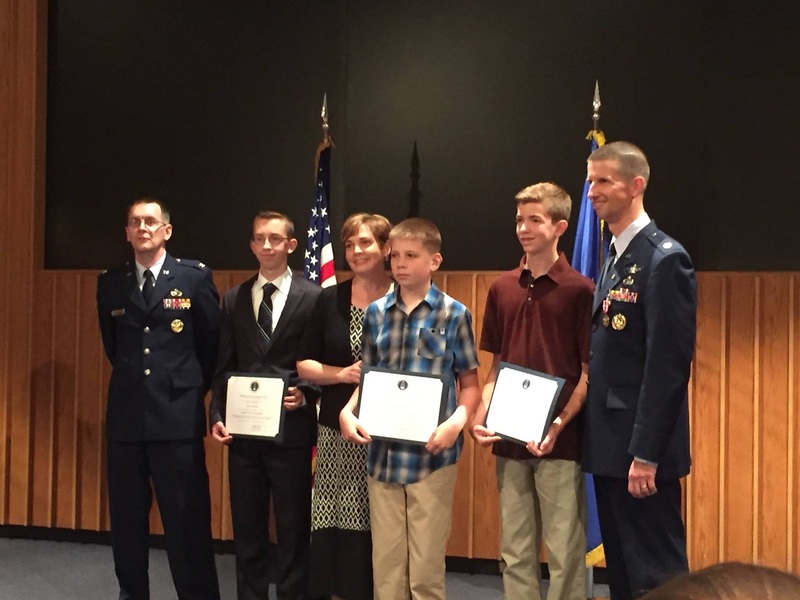 As I sat at the ceremony with my husband, I was in awe of the amazing things Matthew had accomplished in his time in the Air Force. He has lived all over the country, had walked on the launch pad for the space shuttles and created technology and problem solved to help make our country stronger and to save the taxpayers money. His journey has been exciting and at times trying on his family, but together they have come through it and are ready for the next phase of their adventures in Massachusetts. As he was giving his thank you remarks, and as the Colonel was talking about all Matthew had accomplished, I found myself growing prouder and prouder of the man he had become. Someone I knew worked on ships that went into space, someone I went to school with and received Christmas cards from worked at the Pentagon in Washington DC. The word slug was passed around to some people who aren’t Lt. Col. Matthew McQuinn, Retired. And, boy did I feel that way. I was full of pride for the man who at one point helped convince me that I should be on the math team and the computer team in high school. (That was a disaster.) However, I was envious of the travel and adventures their family had had, despite having my own adventures. Seeing someone pass from one life experience into another and hear about all the amazing things he had done in his career gave me perspective on growing up. We all have our paths in life. Some paths lead to greatness for many, others lead to a quieter life where what we does matters to a few or a few hundred. It was great to see Matthew, Julie and their boys, as well as their parents and family members. This day and age it doesn’t make sense not to stay in touch. It’s easier than ever before. Reach out to someone you used to know and say “hello”. You might be amazed at the perspective you find.